Textile fibers, threads, yarns and fabrics are measured in a multiplicity of units. A fiber, a single filament of natural material, such as cotton, linen or wool, or artificial material such as nylon, polyester, metal or mineral fiber, or man-made cellulosic fibre like viscose, Modal, Lyocell or other rayon fiber is measured in terms of linear mass density, the weight of a given length of fiber. Various units are used to refer to the measurement of a fiber, such as: the denier and tex (linear mass density of fibers), super S (fineness of wool fiber), worsted count, woolen count, linen count (wet spun) (or Number English (Ne)), cotton count (or Number English (Ne)), Number metric (Nm) and yield (the reciprocal of denier and tex). A yarn, a spun agglomeration of fibers used for knitting, weaving or sewing, is measured in terms of cotton count and yarn density. Thread, usually consisting of multiple yarns plied together producing a long, thin strand used in sewing or weaving, is measured in the same units as yarn. Fabric, cloth typically produced by weaving, knitting or knotting textile fibers, yarns or threads, is measured in units such as the momme, thread count (a measure of the coarseness or fineness of fabric), ends per inch (e.p.i) and picks per inch (p.p.i). Micronaire is a measure of the air permeability of cotton fiber and is an indication of fineness and maturity. Micronaire affects various aspects of cotton processing. Not a true unit of measure, S or super S number is an index of the fineness of wool fiber and is most commonly seen as a label on wool apparel, fabric, and yarn. Slivers, tops and rovings are terms used in the worsted process. The sliver come off the card, tops come after the comb, rovings come before a yarn, and all have a heavier linear density. If the metric system is in use the linear density of slivers and tops is given in grams per meter. Tops destined for machine processing are typically 20 grams per meter. Hobby spinners typical use a little heavier top. Similar to tex and denier, yield is a term that helps describe the linear density of a roving of fibers. However, unlike tex and denier, yield is the inverse of linear density and is usually expressed in yards per pound (yd/lb). Number of twists per inch. 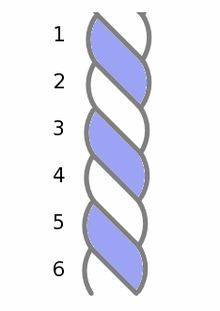 Number of twists per meter. There are two systems used for presenting linear density, direct and indirect. When the direct method is used the length is fixed and the weight of yarn measures, for example, textile gives the weight in grams of one kilometer of yarn. An indirect method fixes the weight and gives the length of yarn created. The textile industry has a long history and there are various units which is highly using. Tex is more likely to be used in Canada and Continental Europe, while denier remains more common in the United States and United Kingdom. The International System of Units uses kilogram per meter for linear density. den (denier) grams (0.035 oz) per 9 kilometres (5.6 mi) of yarn. Den is a direct measure of linear density. dtex (denier; deci-tex) grams (0.035 oz) per 10 kilometres (6.2 mi) of yarn. Dtex is a direct measure of linear density. gr/yard grains (0.065 g) per yard (0.91 m) of yarn. Gr/yard is a direct measure of linear density. ECC or NeC or Ne (English Cotton Count) The number of 840 yards (770 m) lengths per pound (0.45 kg). ECC is an indirect measure of linear density. It is the number of hanks of skein material that weighs 1 pound (0.45 kg). Under this system, the higher the number, the finer the yarn. In the United States cotton counts between 1 and 20 are referred to as coarse counts. A regular single-knit T-shirt can be between 20 and 40 count; fine bed sheets are usually in the range of 40 to 80 count. The number is now widely used in the staple fiber industry. Lea or NeL (linen Count) The number of 300 yards (270 m) lengths per 1 pound (0.45 kg) of yarn. Lea is an indirect measure of linear density. Ne or NeC or ECC (Number English). The number of 840 yards (770 m) lengths per pound (0.45 kg). Ne is an indirect measure of linear density. It is the number of hanks of skein material that weigh 1 pound (0.45 kg). Under this system, the higher the number, the finer the yarn. In The United States cotton counts between 1 and 20 are referred to as coarse counts. A regular single-knit T-shirt can be between 20 and 40 count; fine bed sheets are usually in the range of 40 to 80 count. The number is now widely used in the staple fiber industry. NeC or Ne or ECC (Number English Cotton). The number of 840 yards (770 m) lengths per pound (0.45 kg). NeC is an indirect measure of linear density. It is the number of hanks of skein material that weigh 1 pound (0.45 kg). Under this system, the higher the number, the finer the yarn. In the United States cotton counts between 1 and 20 are referred to as coarse counts. A regular single-knit T-shirt can be between 20 and 40 count; fine bed sheets are usually in the range of 40 to 80 count. The number is now widely used in the staple fiber industry. NeK or NeW (Worsted Count). The number of 560 yards (510 m) lengths per 1 pound (0.45 kg) of yarn. NeK is an indirect measure of linear density. NeK is also referred to as the Spinning count. NeL or Lea (Linen Count). The number of 300 yards (270 m) lengths per 1 pound (0.45 kg) of yarn. NeL is an indirect measure of linear density. NeS (Woollen Count or Yorkshire skein). The number of 256 yards (234 m) lengths per 1 pound (0.45 kg) of yarn. NeS is an indirect measure of linear density. One of the best known of the many different woollen yarn counts. NeW or NeK (Worsted Count). The number of 560 yards (510 m) lengths per 1 pound (0.45 kg) of yarn. NeW is an indirect measure of linear density. tex grams (0.035 oz) per kilometer (0.62 mi) of yarn. tex is a direct measure of linear density. Tex is used for measuring fiber size in many products, including cigarette filters, optical cable, yarn and fabric. filament tex grams (0.035 oz) per kilometer (0.62 mi) of a single filament. The following table summarizes several measures of linear density and gives their conversion factors. Denier (/ˈdɛniər/) or den (abbreviated D), a unit of measure for the linear mass density of fibers, is the mass in grams per 9000 meters of the fiber. The denier is based on a natural reference: a single strand of silk is approximately one denier; a 9000-meter strand of silk weighs about one gram. The term denier comes from the French denier, a coin of small value (worth ​1⁄12 sou). Applied to yarn, a denier was held to be equal in weight to 1⁄24 ounce (1.2 g). Microdenier describes filaments that weigh less than 1 g per 900 m.
There is a difference between filament and total measurements in deniers. Both are defined as above; but the first relates to a single filament of fiber (commonly called denier per filament (DPF)), whereas the second relates to a yarn. Broader terms, such as fine may be applied, either because the overall yarn is fine or because fibers within this yarn are thin. A 75-denier yarn is considered fine even if it contains only a few fibers, such as thirty 2.5-denier fibers; but a heavier yarn, such as 150 denier, is considered fine only if its fibers are individually as thin as one denier. In practice, measuring 9000 meters is both time-consuming and unrealistic. Generally a sample of 900 meters is weighed, and the result is multiplied by ten to obtain the denier weight. In tights and pantyhose, the linear density of yarn used in the manufacturing process determines the opacity of the article in the following categories of commerce: ultra sheer (below 10 denier), sheer (10 to 30 denier), semi-opaque (30 to 40 denier), opaque (40 to 70 denier) and thick opaque (70 denier or higher). For single fibers, instead of weighing, a machine called a vibroscope is used. A known length of the fiber (usually 20 mm) is set to vibrate, and its fundamental frequency measured, allowing the calculation of the mass and thus the linear density. l/m = 1693 × lm/Nec × m/kg, where l/m is the yarn length in meters, lm/Nec is the English cotton count and m/kg is the yarn weight in kilograms. Mommes (mm), traditionally used to measure silk fabrics, the weight in pounds of a piece of fabric if it were sized 45 inches by 100 yards (1.2 m by 90 m). One momme = 4.340 g/m²; 8 mommes is approximately 1 ounce per square yard or 35 g/m². The momme is based on the standard width of silk of 45 inches (1.2 m) wide (though silk is regularly produced in 55-inch (1.4 m) widths, and, uncommonly, in even larger widths). The higher the weight in mommes, the more durable the weave, and the more suitable it is for heavy-duty use. And, the heavier the silk, the more opaque it becomes. This can vary even between the same kind of silk. For example, lightweight charmeuse is translucent when used in clothing, but 30-momme charmeuse is opaque. Thread count or threads per inch (TPI) is a measure of the coarseness or fineness of fabric. It is measured by counting the number of threads contained in one square inch of fabric or one square centimeter, including both the length (warp) and width (weft) threads. The thread count is the number of threads counted along two sides (up and across) of the square inch, added together. It is used especially in regard to cotton linens such as bed sheets, and has been known to be used in the classification of towels. There is a common misconception that thread count is an important consideration when purchasing bedding. However, linen experts claim that beyond a thread count of 400, there is no difference in quality. The amount of thread that can fit into a square inch of fabric is limited, suggesting that bedding beyond 400 count is likely a marketing strategy. Inflated thread counts are usually the result of including the number of strands in a twisted yarn in the claimed thread count. Ends per inch (EPI or e.p.i.) is the number of warp threads per inch of woven fabric. In general, the higher the ends per inch, the finer the fabric is. The current fashion is to wear T-shirts with a higher thread count, such as soft and comfortable "30 single" tee shirt that has 30 threads per inch as contrasted to the standard T-shirt with an 18 thread count per inch. Ends per inch is very commonly used by weavers who must use the number of ends per inch in order to pick the right reed to weave with. The number of ends per inch varies on the pattern to be woven and the thickness of the thread. The number of times the thread can be wrapped around a ruler in adjacent turns over an inch is called the wraps per inch. Plain weaves generally use half the number of wraps per inch for the number of ends per inch, whereas denser weaves like a twill weave will use a higher ratio like two-thirds of the number of wraps per inch. Finer threads require more threads per inch than thick ones, and thus result in a higher number of ends per inch. The number of ends per inch in a piece of woven cloth varies depending on the stage of manufacture. Before the cloth is woven, the warp has a certain number of ends per inch, which is directly related to the size reed being used. After weaving, the number of ends per inch will increase, and it will increase again after being washed. This increase in the number of ends per inch (and picks per inch) and shrinkage in the size of the fabric is known as the take-up. The take-up is dependent on many factors, including the material and how tightly the cloth is woven. Tightly woven fabric shrinks more (and thus the number of ends per inch increases more) than loosely woven fabric, as do more elastic yarns and fibers. Picks per inch/Inch (or p.p.i.) is the number of weft threads per inch of woven fabric. A pick is a single weft thread, hence the term. In general, the higher the picks per inch, the finer the fabric is. Air permeability is a measure of the ability of air to pass through a fabric. Air permeability is defined as "the volume of air in cubic centimeters (cm3) which is passed through in one second through 100cm2 of the fabric at a pressure difference of 10 cm head of water", also known as the Gurley unit. Factors that affect air permeability include porosity, fabric thickness and construction, yarn density, twist, and crimp, layering, and moisture within the fabric. The concept of air permeability is important for the design of active wear and insect netting. The unit Martindale quantifies a textile's resistance to abrasion when used for upholstery. ^ "Fiber Properties". Cotton Incorporated. Retrieved 2018-05-23. ^ "Cotton value addition – The impact of cotton fibre properties on textile". Cotton Guide. International Trade Centre. Retrieved 2018-05-21. ^ a b c d e f g h i j k Gohl, Erhard; Vilensky, Leo (1990). "26: Sundry Facts about Yarns". Textiles For Modern Living. Melbourne: Longman Cheshire. p. 190,191. ISBN 0582874149. ^ a b Haynes, Williams (1946). "XVII: New Fibres: New Fabrics". This Chemical Age. London: Secker and Warburg. p. 217. ^ "ASTM D1907 / D1907M – 12 Standard Test Method for Linear Density of Yarn (Yarn Number) by the Skein Method". Astm.org. Archived from the original on 2016-11-13. Retrieved 2016-12-18. ^ "UK Tights & My Tights Is Earth's Largest Hosiery Store". Uktights.com. Archived from the original on 2015-03-18. Retrieved 2016-12-18. ^ a b "Fahrradreifen – Schwalbe Fahrradreifen und Rollstuhlreifen". Schwalbe.de. Retrieved 2016-12-18. ^ Louie, Elaine (14 May 2018). "High Thread Counts May Not Lead to Sweet Dreams". Archived from the original on 16 November 2017 – via NYTimes.com. ^ "Busting the thread count myth". 2018-10-25. Retrieved 2019-02-13. ^ "ケータリング情報館". Nationaltextile.org. Archived from the original on 2016-12-19. Retrieved 2016-12-18. ^ "ASTM Fabric Count Tech News". Astm.org. Archived from the original on 2011-08-10. Retrieved 2016-12-18. ^ "Pick." The Oxford English Dictionary. 2nd ed. 1989. ^ a b Stevens, K; Fuller, M (2015). "Thermoregulation and clothing comfort". Textile-Led Design for the Active Ageing Population. p. 117. doi:10.1016/B978-0-85709-538-1.00009-2. ISBN 9780857095381. ^ a b "What Is Air Permeability?". Acadian Industrial Textiles. Retrieved 2018-05-23.